Many pieces of archive material have been framed and mounted on the walls in the corridors of the AA Melbourne Central Service Office (CSO), the foyer area and also the Archive Room. The door on the archive room has been painted to duplicate the first ever cover of the book Alcoholics Anonymous. Quite a few new gems of Victorian AA history have been donated by members and families of deceased members. Three large glass topped display cabinets have been installed, one in the foyer, and two in the Archive Room. An interactive viewing screen has been mounted on the wall in the Archive Room, so members can see presentations relevant to Victorian AA history. 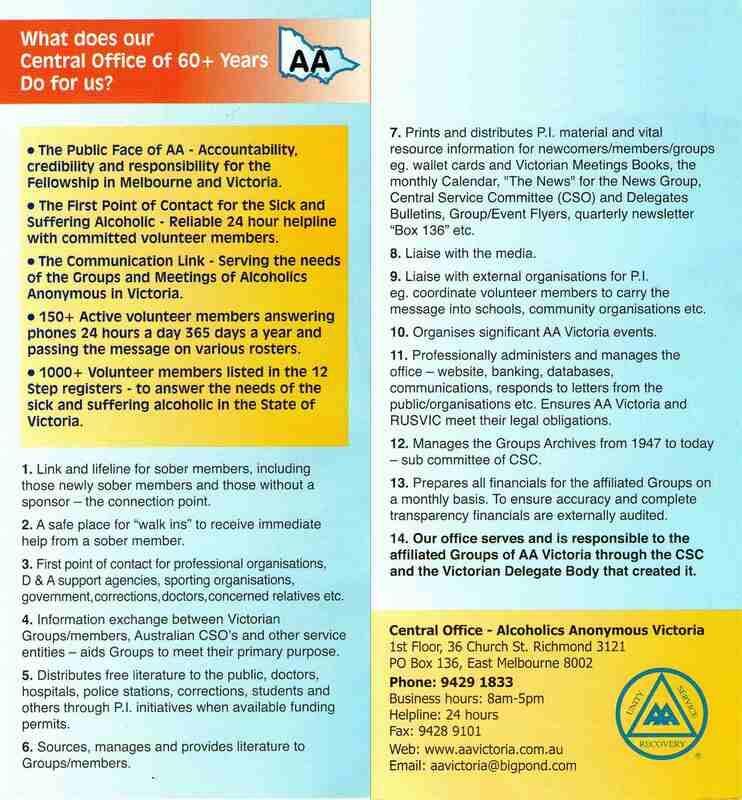 This includes the presentation of AA’s long and wonderful history in Victoria that was shown at the 64th Anniversary Celebration. Listen to new mp3 recordings of inspirational speakers. Original copies of very old out of print literature. In the foyer there is a donated coffee table with historical items placed under glass.